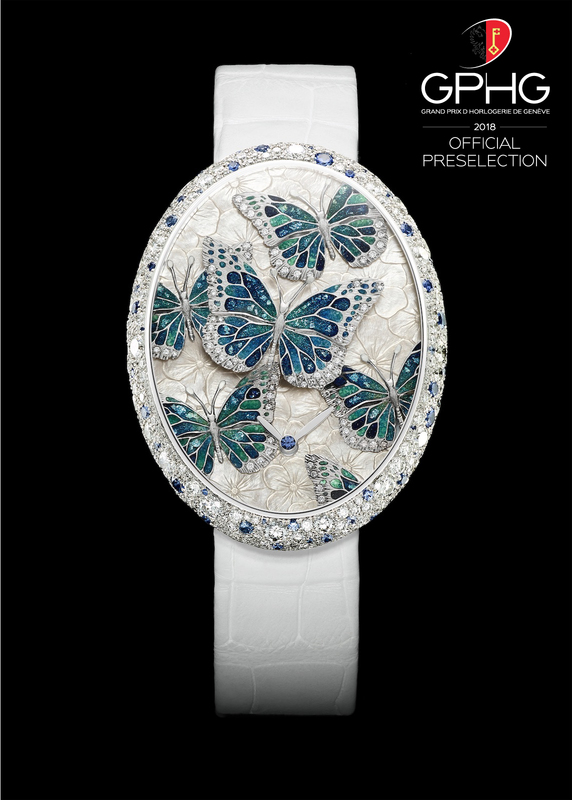 The unique watch “Ballet in Blue” explores the nature in its entire splendor, fragile and ephemeral; the hand sculptured butterflies are positioned on a dial off hand engraved flowers in mother of pearl. The enamel in the wings has been realized by the highly talented Anita Porchet, a true work of refined craftsmanship. This unique edition comes to live in a 3dimensional microcosm with a thickness of up to 5mm under the glass in the center. The butterfly in the center seems to try to escape from the dial, taking off into the sky. With the enamel “grand feu” on hand engraved white gold, Anita Porchet wanted to bring extra life to the light inside the blue and green enamel by adding tiny silver flakes (paillons) inside the wings of these butterflies, giving this composition a close to real effect. 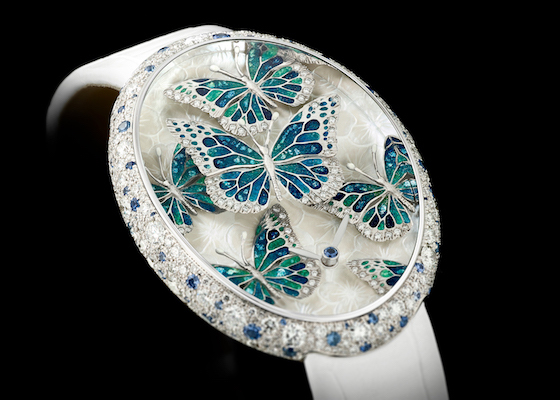 Each butterfly is manufactured by hand and set with small diamonds on the tip of the wings. The watch case is in “snow setting” with diamonds and blue sapphires. Email grand feu avec paillons d’argent sur Papillons sculptés main. L’extérieur des ailes serti d’une rangée de diamants. Fond en nacre extra-blanche sculptée. Come and see the watch at our showroom.